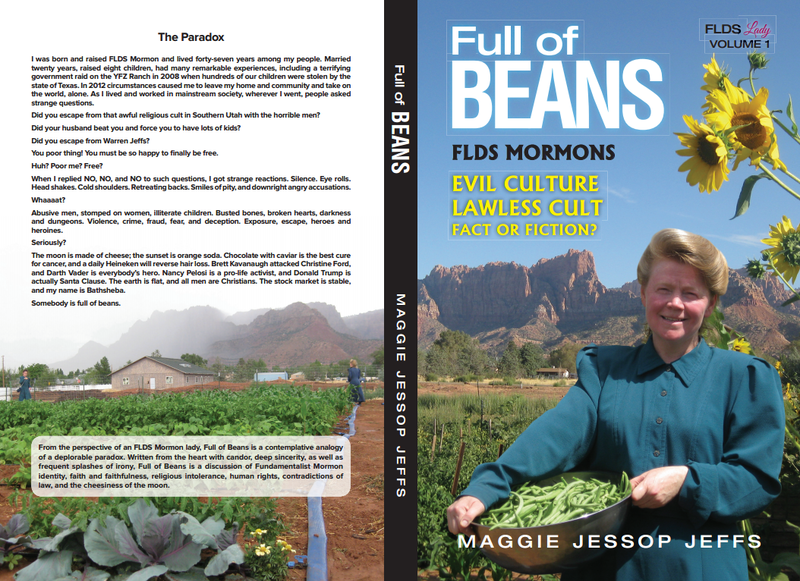 From the perspective of FLDS Mormon lady, Maggie Jessop Jeffs, Full of Beans is a contemplative analogy of a deplorable paradox. Written from the heart with candor, deep sincerity, as well as frequent splashes of irony, Full of Beans is a discussion of Fundamentalist Mormon identity, faith and faithfulness, religious intolerance, human rights, contradictions of law, and the cheesiness of the moon. I was born and raised FLDS Mormon and lived forty-seven years among my people. Married twenty years, raised eight children, had many remarkable experiences, including a terrifying government raid on the YFZ Ranch in 2008 when hundreds of our children were stolen by the state of Texas. In 2012 circumstances caused me to leave my home and community and take on the world, alone. As I lived and worked in mainstream society, wherever I went, people asked strange questions. Did you escape from that awful religious cult in Southern Utah with the horrible men? Did your husband beat you and force you to have lots of kids? Did you escape from Warren Jeffs? You poor thing! You must be so happy to finally be free. When I replied NO, NO, and NO to such questions, I got strange reactions. Silence. Eye rolls. Head shakes. Cold shoulders. Retreating backs. Smiles of pity, and downright angry accusations. Abusive men, stomped on women, illiterate children. Busted bones, broken hearts, darkness and dungeons. Violence, crime, fraud, fear, and deception. Exposure, escape, heroes and heroines. The moon is made of cheese; the sunset is orange soda. Chocolate with caviar is the best cure for cancer, and a daily Heineken will reverse hair loss. Brett Kavanaugh attacked Christine Ford, and Darth Vader is everybody’s hero. Nancy Pelosi is a pro-life activist, and Donald Trump is actually Santa Clause. The earth is flat, and all men are Christians. The stock market is stable, and my name is Bathsheba. Somebody is full of beans.